Design and Build Metal Buildings | D.R. Poulin Construction, Inc.
To design and build metal buildings requires a specialized contracting firm familiar with the processes for erecting commercial, industrial, institutional, and recreational metal buildings. At D.R. Poulin, we understand how to design and build metal buildings because that’s all we do. 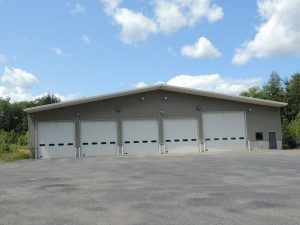 If you’re looking to design and build metal buildings, we are the only authorized contractor that can design and build metal buildings from the country’s leading metal building system company, Kirby Building Systems. Pre-fabricated metal buildings can help you reduce the cost of time-consuming, traditional, custom-built construction. When we design and build metal buildings, we can easily combine wood, brick, glass, stone masonry and other materials to customize the interior and exterior, creating a unique, cost-efficient building that perfectly fits your specific needs. All of our supervisors are OSHA-certified professionals qualified to design and build metal buildings. To ensure a solid, reliable, and long-lasting metal building, we utilize state-of-the-art computer-aided-design technology to provide our clients with accurate, efficient building plans and highly-realistic renderings to make it easy to visualize exactly what their buildings are going to look like. To design and build metal buildings quickly and easily, Kirby Building Systems provide a wide variety of framing systems that are ideal for the unique requirements of many religious buildings, educational institutions, and municipal facilities such as fire stations. Kirby metal building systems are even cost-effective solutions for industrial-use buildings requiring large clear spans, cranes, and mezzanines. If you’d like to know more about how we design and build metal buildings, give us a call at D.R. Poulin. We’d be happy to provide more information and an estimate to design and build metal buildings for your company or organization.